Welcome to Rose Memorial Park Cemetery. We have been serving the community of Hammond, Louisiana for over 92 years. We are located just 2 blocks west of the campus of Southeastern Louisiana University on Western Avenue. In November, we began construction on Phase VI of our new mausoleum. Call today to pick your location and get a great price! 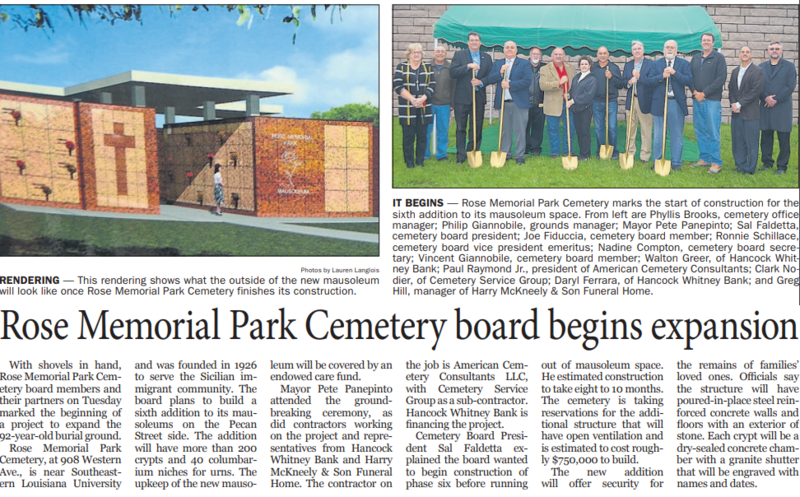 Rose Memorial Park Cemetery began as a cemetery dedicated to serving the local Sicialian immigrant community. Today, we take great pride in serving all families of our community. Rose Memorial Park Cemetery is a non-profit corporation, locally owned and operated, and will be here to serve you and your families for years to come. We, the members of Rose Memorial Park Cemetery and Mausoleum, are committed to assuring our community with a quiet, dignified, peaceful, beautiful and inspiring atmosphere with perpetual care.